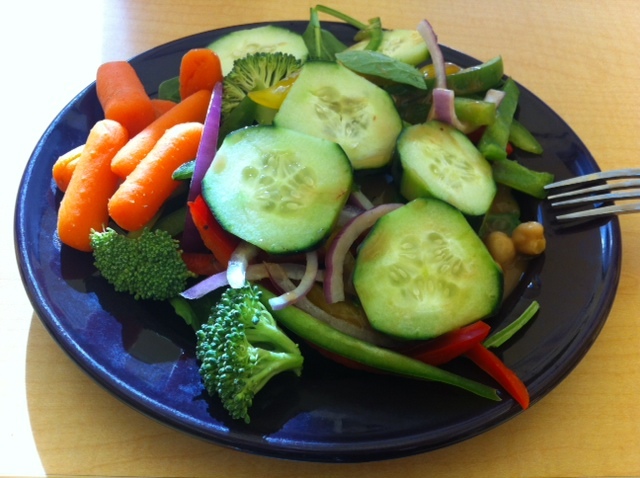 This week is the week of my vegan challenge. Started on Monday, therefore I thought it would be a good idea to record WIAW for the first day of being vegan: Monday. Surprisingly, the day easily went by. It wasn’t exactly challenging, or not as challenging as I though it would be. I just have to be more conscious of what I am putting in my body which is a great behavior that I wouldn’t mind as becoming a habit.. we should all be aware of what we put in our bodies: what ingredients are in different things, etc. This is already proving to be an eye-opening and informational experience and I am excited to be moving forward. 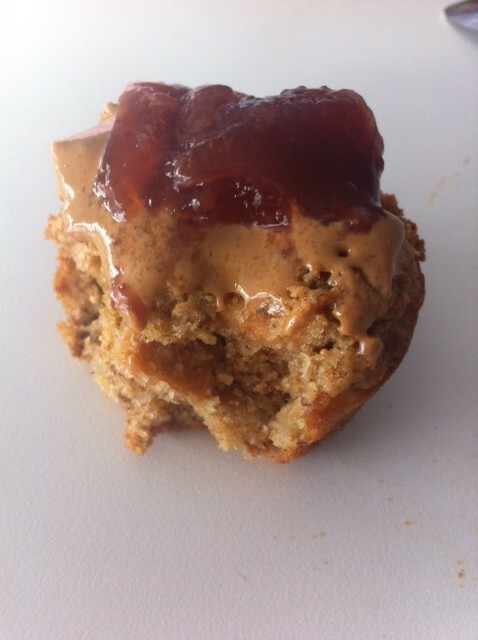 My breakfast consisted of a delicious bran apple muffin with some peanut butter and strawberry preserves with a big mug of oolong tea on the side. Then I had lunch at Hot Woks Cool Sushi with two of my friends. We got some edamame for appetizer and for the main lunch I got a “mega veggie” roll with broccoli, beets, avocado, something else and soy sauce. Really good! After class I had a salad with some balsamic vingrette. I usually get my salads topped with cottage cheese but since I’m vegan this week, that was not an option. I actually like the taste of it better with the vingerette so yay! Change is already happening! 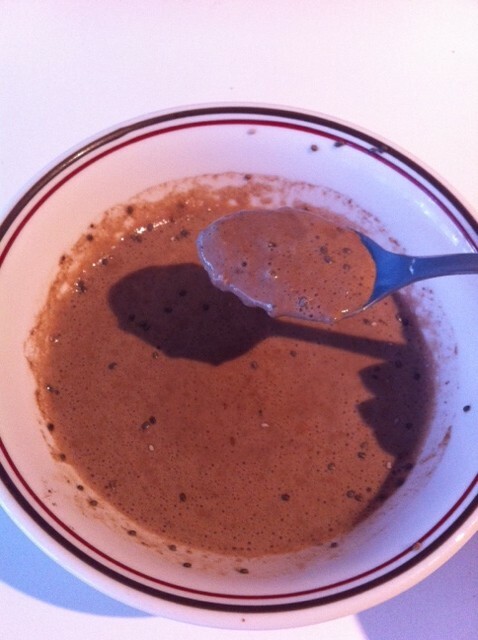 Another muffin and some chocolate chia pudding. The bran apple muffin looks fantastic. Definitely want to try making it – and its vegan! That’s just amazing. Haha yeah, these were VERY salty! I’m not much of a sushi person, but I must admit that roll looks pretty tempting! Your sushi looks SO good!! I haven’t had any in so long, and seeing your pictures is totally making my mouth water! Why, oh why does it all have to be so expensive?! That muffin looks so delicious…and I am now wanting some veg sushi. All you can eat preferably! Love the avocado on top! Glad to hear the vegan thing is going good so far…stick with it! Sushi was the thing I never thought I’d give up, but I have (for the most part). 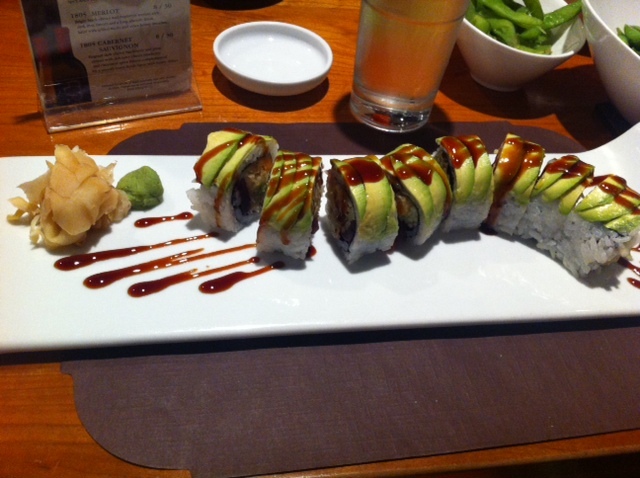 Occasionally I indulge in a veggie roll but they don’t quite have the appeal of raw fish that I used to love. 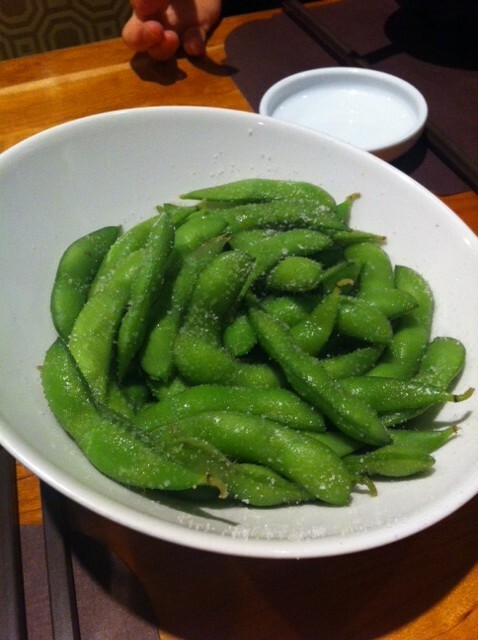 I do still enjoy the edamame, wakame salad and sunomono. Thanks for stopping by jenmijenmi.com and posting. Your WIAW post is lovely and love your pictures. Your sushi roll looks amazing! I wish we had better vegan/vegetarian sushi options at restaurants here. All your eats looks amazing! I am surprised at easy eating vegan can be. Sometimes it’s hard but when you know your options, it becomes so easy! This is a great challenge, I might want to try it! It honestly is not that hard! As long as you get your mind into it. I almost don’t want to go back to eating dairy and I think I’m going to limit my dairy intake a lot after this challenge.